Since 94% of the readers who voted on the Do Post-1955 Pickups Belong On DOTS? poll answered in the affirmative, I went right out and shot the first such truck I could find. I didn't have to go far, because Alameda is chock-full of 60s and 70s pickups; this '71 GMC is just the first of many you'll see here (and don't worry, Ford, Mopar, and Japanese pickup fans- you'll see plenty of stuff not made by The General). Do Post-1955 Pickups Belong On DOTS? 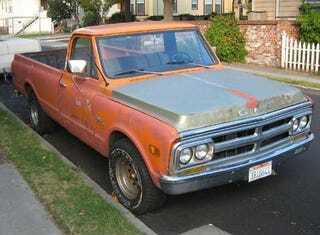 The 1500 was the GMC-branded 1/2-ton pickup, pretty much the same thing as the Chevy C10. The orange-and-blue paint job, no doubt applied with rattle-cans on a jobsite back in '91, looks pretty good on this truck. I've always thought a pickup truck should be ready for you to toss a big old paint-spattered ladder into the bed from 10 feet away, and you shouldn't care if it puts a dent in something. No goddamn crew cab, leather upholstery, or 10-speaker stereo here. As for cup holders, you just let the coffee spill on the floor! Now I need to go listen to some Merle Haggard. But GM didn't totally skimp on style here- some nice-looking industro-trim on this grille.